It’s grilling week here on Simple Bites! Join us as we bring you simple recipes for the grill that feature seasonal produce. The first time I recall seeing greens grilled was overr five years ago at swanky brunch in celebration of a baby’s baptism. Coral-colored wedges of radicchio and Belgian endive were wilted and slightly charred on the grill before being tossed with a simple dressing of fresh lemon juice and fine olive oil. A sprinkling of sea salt finished the dish, and it was placed on the table, where its smoky aroma made my stomach twist with hunger. The salad was warm and sultry; vibrant in flavor – and a totally unique side dish at an event where the buffet tends to play it safe. I’ve been enamored with grilling greens ever since. There’s something about those slightly caramelized natural sugars that heighten the flavors of grilled greens, and the contrast of charred edges, soft leaves and crunchy cores makes for a salad crammed with delightful textures. It’s a given – grilled salads are a hot item on my back yard patio table this summer. They’re simple, versatile, and just downright tasty. Yesterday, Romaine hearts and lobster tails shared the grill and later came together for a light and gorgeous Father’s Day supper. Perfection. So what greens can you grill? Romaine, radicchio, endive, iceberg, kale, chard, green onion, and even spinach, although that last one is a bit more of a challenge. Try and stick with varieties that can be cut into wedges with the core still intact, that way the greens hold together on the grill. Like all Caesar salads, this version is best enjoyed immediately after tossing. It will be slightly warm, which I find only adds to its appeal. I’ve used crouton, but you could just as easily grill a few slices of crusty bread, then tear them up and toss them into your salad. Preheat grill to 400°F, then reduce burners to medium heat. Slice Romaine hearts in half lengthwise and place on grill. Grill for about two minutes per side, until grill marks appear and outer leaves start to blacken slightly. Remove lettuce from grill and place on a large cutting board. With a sharp knife, quickly chop Romaine cross-wise into 1-inch strips; transfer lettuce to a large bowl. 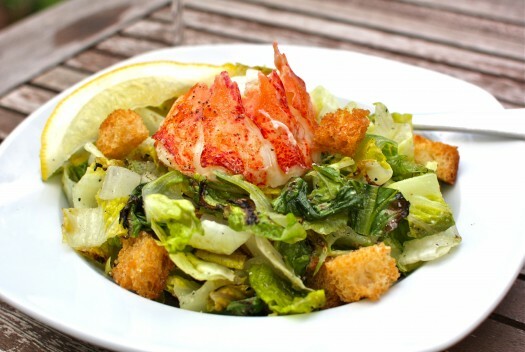 Toss lettuce with Caesar dressing, Parmesan, and croutons until well combined. Taste salad, and add salt if necessary. Serve at once. Crush garlic with the blade of a chef’s knife and transfer to a small bowl. Add lemon juice, salt, and anchovy paste and whisk to combine. Slowly drizzle in olive oil until vinaigrette is emulsified. Use at once or transfer to a small jar and refrigerate for up to five days. Have you thrown lettuce on a grill yet? I’ve never heard of grilling your greens before now. I’m going to try it soon. Thanks! Yes! I love grilled salads but they haven’t been on my radar lately. Thanks for the reminder. Oh, and the addition of lobster sounds so great. The only greens I’ve ever grilled were radicchio (with great success). That salad looks amazing. Seriously… this post is poetry. The way you have described grilled greens is just beautiful!! Cant wait to try it! I have seen this done before and I was always curious about it and have wanted to try it! I am going to testing this recipe out!! I can’t wait! no, not yet but it looks yummy! This is sooooo exciting! I didn’t know you could grill greens! Going to give it a try! I used to grill radicchio all the time but haven’t done it in a while. Thanks for the inspiration to get back to grilling them! Just wondering how this all works with the “prewash before eating” labels I see on bags of romaine hearts? Would you give them a quick rinse out after slicing or is there not an issue with dirt inside the hearts? We absolutely *love* warm/wilted salads and this would take it to a whole new level! Thanks for the great recipe! Wow I never thought that grilling greens would be this good! 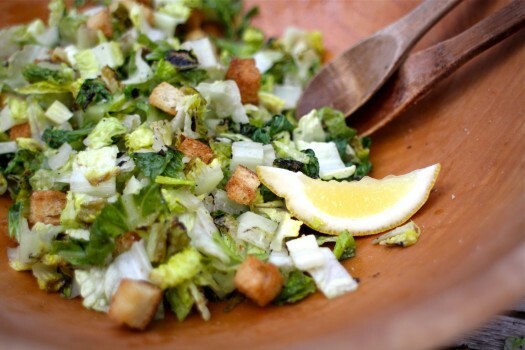 The Grilled Caesar Salad looks sumptuously delicious and healthy! I love grilled food and I love salad! Thank you for sharing! I have never had a grilled Caesar Salad, but I must say that it looks incredibly delicious.